Don't Travel to Israel Ever for Any Reason! Doing so could be nightmarish - especially for anyone wishing to visit Occupied Palestine. "We gave and attended music classes (violin and flute) at the Edward Said National Conservatory in Ramallah and helped to create a music school in Jericho," they said. "This year we had decided to go back during our recent Easter break to see our friends again and to return to the places where we had spent time the previous year," the students said. On April 19, they arrived at Tel Aviv's Ben Gurion Airport. When the customs officer heard they planned to visit Ramallah they "were sent straight to a small room where other people were waiting for us," they explained. They were harshly interrogated separately. Philomene was asked "the reason for her visit, whether or not she had previously been to Israel, and why." Her explanation didn't satisfy the customs officer. 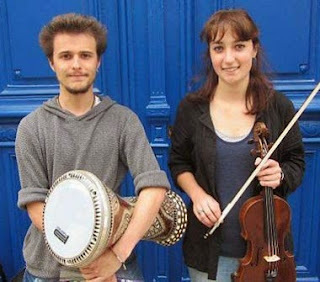 He called her a liar - "because it seemed to him impossible that a 20-year-old would come to Palestine for a year for the sole purpose of playing and studying music." Saying she had no Palestinian cell phone "because she was afraid of placing her contacts in a bad position," the customs officer raged again. He "stood up and pounded the desk with his fists, saying: 'You're a liar. I don't believe you.' "
Bastien experienced the same type grilling. He was warned not to lie like his friend. He "told…the truth but the officer didn't believe him, and a dialogue of the deaf ensued." Harsh interrogation continued for hours. "(T)here (were) five of us in the small room. We are trembling. We want to throw up." "We can't eat the dry sandwich Israeli security had brought us. Next to us a Russian woman passed out." A visitor from Chad was handcuffed and taken away. "A fifty-year-old man, exhausted, was crying in a corner." "The wait was growing unbearable, inhuman. We need to walk to feel better." "The officer insists that Bastien, being pro-Palestinian, can’t have spent a year in Palestine without having gone to Bil’in, a village known for its resistance." "Having never demonstrated, Bastien continued to insist that he hadn’t been there." "When Philomene’s turn came, he asked her exactly the same questions. She gave the same answers." They were treated like terrorists. They were brought to a search room - treated like "objects." Contents of their luggage were thoroughly searched. They were strip-searched. They called it "(t)otal humiliation." In detention, their "jailers" put their belongings in a room. They put them in a cell awaiting deportation. "Here (they were) locked up, with no notion of time in a dirty place, covered with fleas…Three and a half hours later" they were taken to the airport - for a flight to Brussels, not Paris, their destination. Seventeen hours after arriving they landed in Brussels - "where the Belgian border police" awaited them. They returned to France the next day. "Every year at Ben Gurion airport, numerous visitors from a variety of origins are treated similarly," they said. "Their most elementary human rights are flouted: violation of intimacy, psychological torture, dehumanization, racism, theft, trauma." "Few of them present a real danger to Israel (maybe none). In this way, Israel interferes with the smooth development of a great number of humanitarian, cultural, and other projects." World leaders able to stop this outrage do nothing - letting Israel humiliate and abuse their nationals unaccountably. It systematically flouts their fundamental human and civil rights. They're treated like criminals - not legitimate nonthreatening visitors. No one should visit Israel as a tourist or for any other reason - EVER! Doing so risks being treated as abusively as Philomene and Bastien or worse. Rogue states operate this way. Israel and America are the world's worst. They give ruthlessness new meaning. Philomene and Bastien's article first appeared on the AURDIP web site - Association of Universities for the Respect of International Law in Palestine. Stephen Lendman who wrote the above lives in Chicago and can be reached at lendmanstephen@sbcglobal.net. His new book as editor and contributor is titled "Flashpoint in Ukraine: How the US Drive for Hegemony Risks World War III ". wow. Israelis are big fleas.